Dyke Marsh Wildlife Preserve, like the much better-known Theodore Roosevelt Island ten miles to the north, is a living reminder of what the Washington, DC area looked like before it became the metropolis of today. 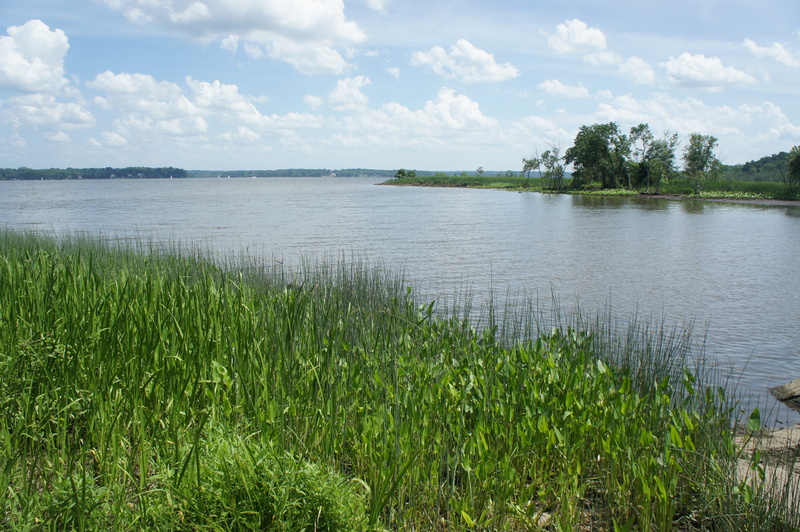 In the days of the Founding Fathers, the Potomac River weaved through a swampy floodplain, a natural wetland habitat for an array of bird and plant species. 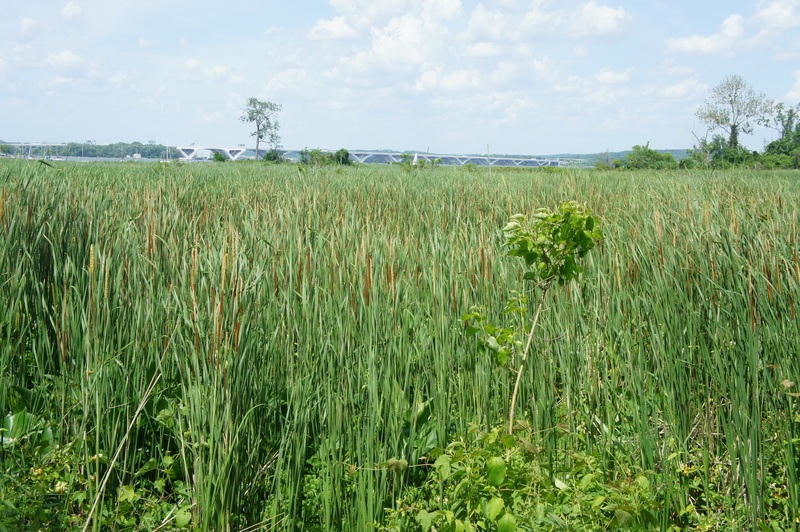 Today the marshes have largely disappeared, save for a couple of spots, including Dyke Marsh, a National Park Service-protected site roughly two miles south of Alexandria, Virginia. The easy, ¾-mile Haul Road Trail cuts through a “swamp forest” before bending east through a tidal marsh along the Potomac. Enjoy it while it lasts—according to researchers, Dyke Marsh is vanishing at an alarming rate and will be gone by 2035. Dyke Marsh Wildlife Preserve is situated between Alexandria and Mount Vernon just off the George Washington Memorial Parkway. It is effectively co-located with Belle Haven Park, a popular picnicking spot, and the Haul Road Trail begins along the short road to the Belle Haven Marina. Park at the Marina—or at Belle Haven Park—and find the trail beginning at a brown sign titled “Dyke Marsh Wildlife Habitat.” There is an orientation wayside at the start. 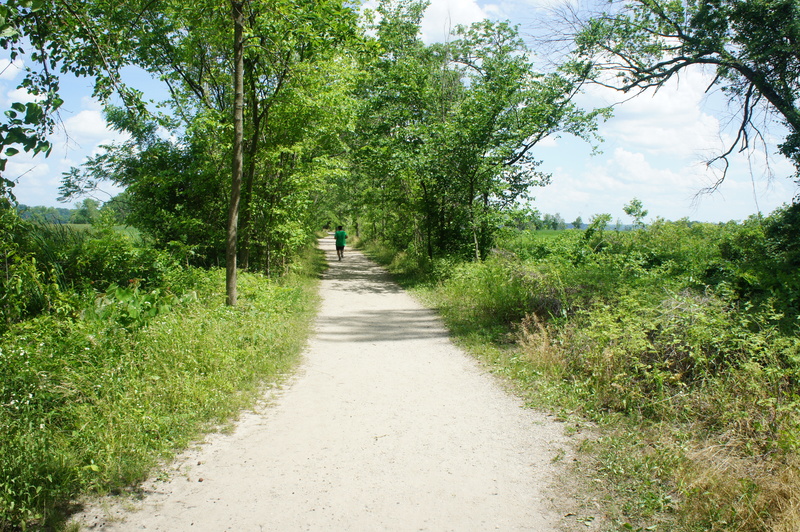 The Haul Road Trail is wide, flat, and wheelchair-accessible. It begins by heading due south through woodlands, with occasional views of the marina and the Potomac River. At around ½ mile, the route makes a hard left and cuts through sunny wetlands. A small bridge at 6/10 mile offers a nice spot various plants, birds, and fish. (Note: When I visited in May, a small pool on the left was filled with whiskered catfish.) Narrow-leaf cattails abound to the right and left. Along the trail, you may hear the sound of maple trees creaking in the wind. A short spur around a minute farther up the trail leads to a rocky beach that offers views to the south and east. 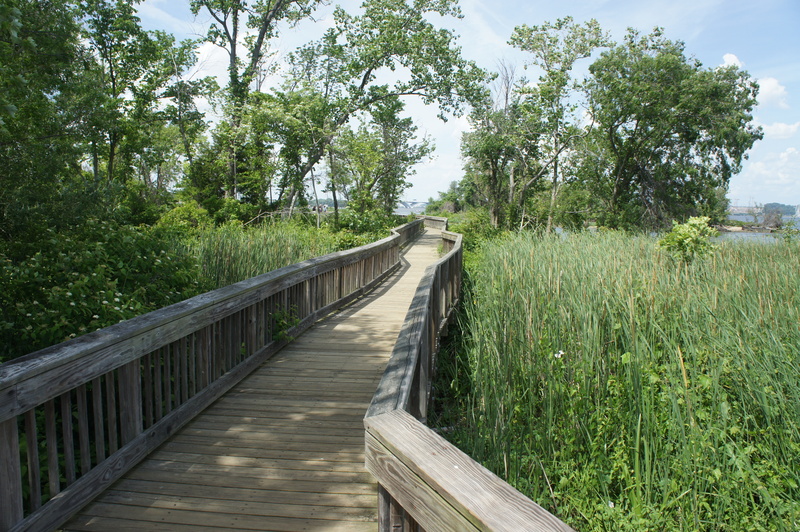 Just beyond, the path turns into a wooden boardwalk as it flirts with the edge of the wetlands. There are two viewing areas—one just before a sharp left-hand turn, and the other at the end of the peninsula. Both are fine spots for wildlife observation. 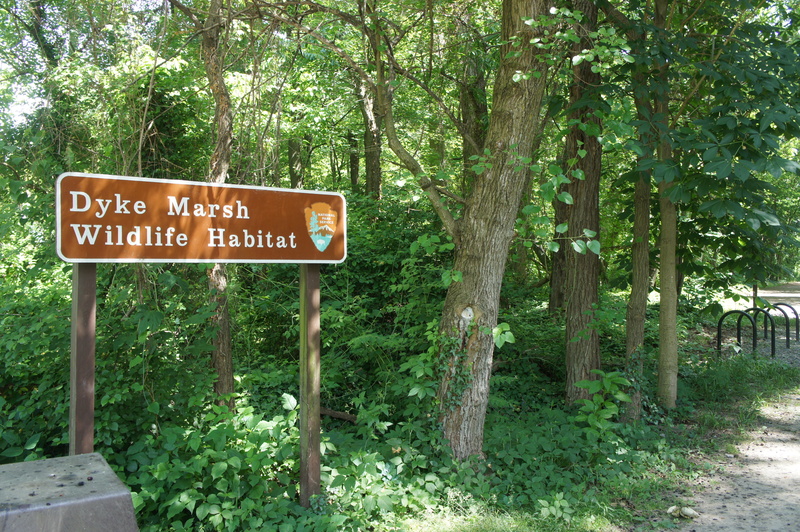 According to the Park Service, Dyke Marsh is more than 2,200 years old and boasts upwards of 300 different plant species, 38 types of fish, and over 270 bird species, including some perennial favorites—the osprey and bard eagle. Among the most ubiquitous are the red-winged blackbird, Carolina wren, and several species of duck. If you’re lucky, you may spot a spotted turtle, five-lined skink, or muskrat. Of course, there are also plenty of signs of human development, most notably the Woodrow Wilson Bridge, which carries Interstate 495, off to the north. But the many kayaks and sailboats add to the allure, and Dyke Marsh is still far enough from the city to feel like a serene getaway. Once finished, turn back the way you came—allot around an hour to walk the path and soak in the environment. This entry was posted in Easy Hikes, George Washington Memorial Parkway, Virginia and tagged Alexandria, Belle Haven Marina, Belle Haven Park, Dyke Marsh, Dyke Marsh Wildlife Preserve, George Washington Memorial Parkway, Haul Road Trail, marsh, Potomac River, Virginia, wheelchair-accessible, Woodrow Wilson Bridge. Bookmark the permalink.